There are many beautiful St Croix resorts and hotels, but here are 5 truly spectacular options. My family has had a home on St Croix for almost 30 years so we don't actually stay as guests at these St Croix resorts, but we LOVE going to the beaches, restaurants, and bars at these resorts everytime we visit the island. So whether you want to stay as a guest in one of these Caribbean luxury resorts or you're just looking for fun St Croix activities and good places to go during the day... these 5 St Croix resorts have it all! My family and I love going to the beaches and restaurants at the Buccaneer every time we're in St Croix. Carambola is another one of my family's all-time favorites! We honestly go to the beach at Carambola practically every other day when we are in St Croix. Not to mention - Carambola Resort is the starting point for one of the most beautiful hiking trails on the island. The trail takes you to incredible naturally formed tidal pools that are unlike anything else on the island. Read more about this hike at the St Croix activities page. Divi Carina Bay is home to the one and only St Croix Casino. The hotel is directly in front of the beach and offers tons of fun activities. There is even an on-site PADI five-star dive operation and activities center. The only downside about this hotel is that it's located in a slightly remote section of the island, so my family and I don't go out there as much as the rest of these St Croix resorts. But maybe a nice secluded island experience is exactly what you're looking for! *Note*- Divi Carina Bay Beach Resort is going ALL-INCLUSIVE in 2011! So if you're searching for Caribbean resorts all inclusive, Divi Carina Bay becomes the ONLY all inclusive beach resort in St Croix effective January 7, 2011. The Palms is constantly ranked as one of the top St Croix resorts by guests and it was even granted the prestigous "Best Hotel on St. Croix" Award in 2009! There are 40 beach front guest rooms and each one has it's own separate patio or balcony. 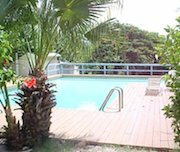 There is a great beach, really good snorkeling, a big swimming pool, an award-winning restaurant, a fun bar, and tons of great St Croix activities like scuba lessons, yoga, and tennis. Colony Cove is about 5 minutes from Christiansted and it's on the same beach as Club St Croix. The resort has a pool, two tennis courts, a bar and restaurant, and a great watersports center. You can rent snorkeling and scuba equipment, floats, windsurfers, kayaks, and small sailboats. And the watersports center can also arrange parasailing, deep sea fishing, and Buck Island snorkeling trips.